Embark on a magnificent journey down the rapid rivers of North America in search for gold while playing the new Wild Falls slot from Play'n GO. Get ready for a truly astonishing and extremely lucrative gold rush when you play the latest slot creation from Play'n GO. The action unfolds in front of a beautiful waterfall and will transport you down the rapid rivers located in North America to search for gold. Instead of using your panels and shovels to discover gold nuggets, you will need to collect lucrative chests that comes packed with gold. 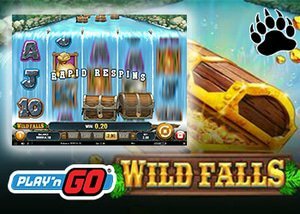 The new slot developed by Play'n GO casino software is called Wild Falls and it features 5 reels with three rows along with 20 non-adjustable paylines. You will also be pleased to know that the game is filled with a plethora of amazing bonus features, such as multipliers, wild symbols, a Gold Rush feature, a Super River of Gold free spin feature, and scatter symbols along with a top jackpot bonus worth 10,000 times your total bet size. The wooden chests will act as both the scatter symbol and wild symbol on the reel set. The wooden chest symbols can only make an appearance on the second, third, and fourth reels to either form a winning combination or unlock one of the bonus features embedded in the game. Players will also be pleased to know that the game comes equipped with a Gold Rush feature that can be randomly triggered in the game. Once activated, all wooden chest symbols will transform into solid gold chests boxes containing multipliers that range from 2x through to 5x. When the Gold Rush feature is activated, players will also get the opportunity to receive re-spins. The golden chest boxes will move down one position with every re-spin until it drops off the bottom row. What's even more impressive is that the golden chest boxes can combine their multiplier values to give you a whopping 125 times your total bet size. Should you be able to obtain three golden chest boxes on the reels during the Gold Rush feature, you will activate the Super River of Gold Free Spins round. All golden chest boxes will remain gold for the duration of the free spins round along with multipliers of up to 5 times. During the base game, you can also unlock a standard free spin feature when 3 wooden chest boxes are displayed. Each wooden chest box will stick to the reels and then drop one symbol position down until it's no longer on the reel set. The free spins will end once all wooden boxes are removed. Apart from the glorious chest boxes, players will also be able to form winning combinations with a plethora of interesting symbols in the base game. This includes a bag of gold paying the highest jackpot bonus worth 2,500 coins, a silver pan with gold nuggets, a shovel and pike, and a lantern. You will also be able to receive smaller winnings when you combine at least 3 pink Aces, yellow Kings, green Queens, blue Jacks, and orange 10's. The new Wild Falls slot from Play'n GO also offers an incredible variety of betting options even though it is limited by 20 non-adjustable paylines. Players can start their gold rush adventure for a minimum spin of $0.20 or increase the bet value up to a maximum of $100.00 a spin. There is a total of 15 betting options in this slot, making it quite diverse for a wide audience of slot enthusiasts. The new Wild Falls slot provides a marvellous 96.50% return to player ratio. We've evaluated all Play'n GO casinos and recommend that you play at Casumo Casino where you'll be welcomed with a 100% welcome bonus up to a maximum of $500 along with 20 lucrative free spins on the extremely popular NetEnt slot, Starburst.